Why do Guests cook on the Lanai? While StarWind Cottage has a full kitchen with built-in appliances, Tradewinds Suite has a kitchenette, with portable cooking appliances on a covered lanai. Appliances include a portable gas cooktop, microwave, toaster, Dutch oven, crepe maker, rice cooker and coffee maker. Why are these on the lanai, instead of indoors? Maui County zoning regulations allow only one kitchen within a dwelling. Since your hosts upstairs have a kitchen, we're not permitted to furnish additional cooking appliances inside the Suite. Some Maui B&B's invite guests to share the host's kitchen, but our guests prefer privacy. For that reason, cooking appliances are provided on the lanai, and are exclusively for your enjoyment. 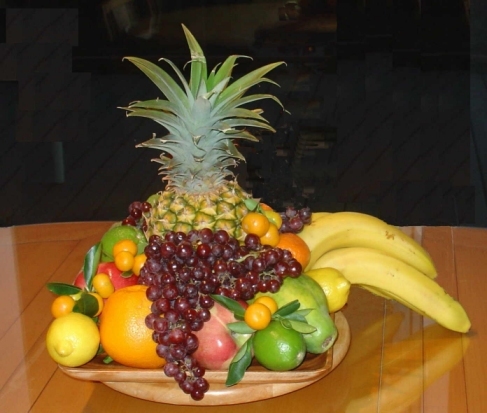 Tropical fruit basket may be ordered as an amenity. It's complimentary when guests stay seven nights or longer.